In Genesis 15, God made a very important promise to Abraham. He promised Abraham that he would have a son. It took faith for Abraham and Sarah to believe this promise because they were very old and had never had any children. 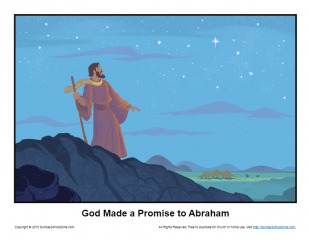 This God Made a Promise to Abraham Story Illustration will help kids remember that we can believe the promises of God just as Abraham did. This story illustration can be used in a Sunday School, classroom or homeschool setting.